Spring migration is complete - and fall migration begins in August. What are hummingbirds eating now that the breeding season is here? 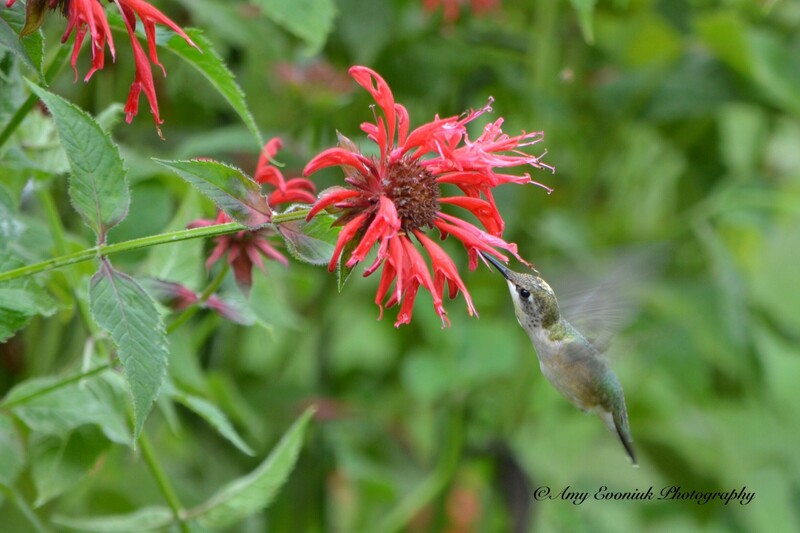 “The red Bee Balm is the flower of choice right now,” wrote Amy Evoniuk from Newburgh, Indiana on June 26, 2018. Where did my hummers go? At this time of year, people often say their hummingbirds have virtually disappeared. Your birds are busy nesting and raising young at this time of year, according to hummingbird expert Lanny Chambers. Feeders and nectar sources are often second choice now. What are hummingbirds eating? Nesting activities require a lot of energy that the female will get from eating small insects and spiders. She also seeks out these protein sources to feed her young. During the time a female is on the nest and caring for her young you may not see much activity at your feeders. She is looking mostly for protein sources to feed her rapidly growing babies. There are many sources of natural nectar available to hummers during the summer. You can attract them to your garden by offering a variety of flowers that bloom in succession over the breeding season. Please report the various types of flowers you see hummingbirds using. After the young birds fledge the nest there will be more activity at your feeder. Watch for inexperienced young birds as they explore your feeder and learn how to use it. The young look almost identical to the female, so look for an increase in visitors to determine when the young are on the wing.